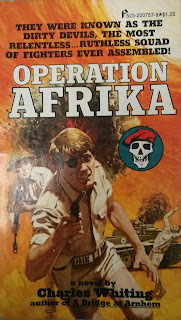 When I first became interested in this series, I assumed it was another Dirty Dozen ripoff - a team of convicts who are recruited by some semi-mysterious Intelligence Officer and offered the chance of a clean slate in order to take on some (no doubt near-suicidal) Commando-esque mission. This was the basic plot of the Destroyers/Dirty Devils series (see previous reviews of books 1 and 4 below), and there is of course no reason multiple series using the same basic plot premise couldn't be written (see also: every ripoff of The Executioner...). 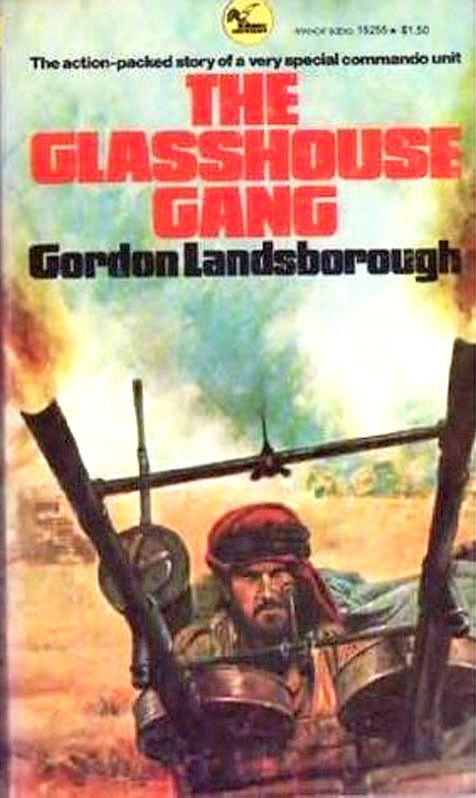 However, Gordon Landsborough's THE GLASSHOUSE GANG is quite different from the expected plot-line. The story instead revolves around a band of British military prisoners, who've been busted for a variety of crimes - some minor, some completely reprehensible - and are serving time in the notorious (but as best as I can tell, completely fictional) Sharafim Prison in Egypt. The prison is run by officers and staff sergeants who are, at best, criminally lax in maintaining humane conditions at the prison, and are, at worst, vicious sadists who take great pleasure in beating and torturing their charges to within an inch of their lives - and occasionally beyond. The first scene of the book is just such an example of two "staffs" brutally tormenting John Offer, the main character. Offer was formerly a Territorial Army quartermaster's sergeant, whose black-market dealings caused him to go on the run. He joins the Regular Army under an assumed name and becomes a lieutenant, but gets recognized by someone from his TA days, and Offer eventually gets busted because of it, demoted to private and sent to the "Glasshouse", slang for prison. Being a former officer (even a false one), Offer is constantly beaten and tormented by the staff sergeants who work there, and when he is finally released, Offer decides that something needs to be done to settle the score against the non-coms and officers who run the prison system. One interesting aspect of Offer's background is that he was originally a stage actor, and once released from prison, Offer puts this background into good use. He gets a local tailor to make him a Captain's uniform, "requisitions" a lorry for his own use, and begins to find and recruit men from the Glasshouse he can trust as they are eventually let out after their sentences are over. Using the power of his assumed role and a cadre of men around him to reinforce the legitimacy of his ruse, Offer and his "Glasshouse Gang" spend the first third of the book slowly building up their numbers, acquiring resources, and taking revenge on a few of the "Screws" (prison guards) who were especially vicious to them. The second third of the book involves Offer and his G.G.C.U. (Glasshouse Gang Commando Unit) executing a prison break, where they free a couple dozen prisoners from Sharafim, and then set up their temporary camp on the edge of the city, where they feast on stolen food and get drunk off of stolen liquor. Eventually these good times end, and the G.G.C.U. flees the law, taking off into the deep desert and eventually arriving at the Siwa Oasis...just as the Germans are attacking and driving the LRDG (the Long Range Desert Group, a unit of deep desert recon men in the British army) out of Siwa. Offer's gang holes up in a grove on the edge of the Oasis for a few weeks, until they discover some of their men (who they thought dead) as well as some LRDG men, in an outdoor prison encampment in Siwa. The last third of the book involves Offer and his men planning and executing the rescue of these prisoners. All in all, this was actually a very entertaining read. John Offer reminds me a lot of Colonel John "Hannibal" Smith from the A-Team - a leader who thinks unconventionally and fights dirty when he's forced to fight at all. There's not a lot of action in the book in the traditional military sense, but what there is, is written well and maintains a brisk, exciting pace. The rest of the characters are amusing and flesh out the story nicely, especially the conflict between Offer and McTone, one of the more dastardly prisoners who joins the G.G.C.U. during the Sharafim jailbreak. I can understand why the series only went four books - it's not really the sort of story that lends itself to a long run without becoming repetitive - but I quite enjoyed the first novel, and as I have acquired the other four books, plan on reading them and reviewing the titles here. If you want British WW2 adventure fare that's a little different, do your best to find and read THE GLASSHOUSE GANG.